It's best to choose a clean and simple design to shorten your prep time. My card consists of a 4.25" x 5.5" kraft cardstock base, a 3.75" x 5" patterned paper panel and a strip of 1.75" x 5" green cardstock. Choosing a large focal image really makes your card pop. 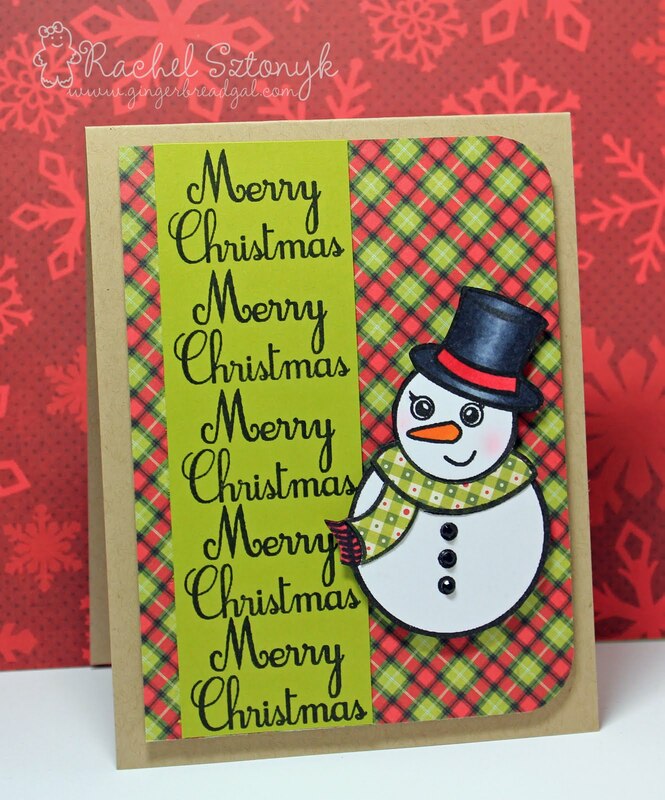 This adorable snowman from the Christmas Melody Stamp Set by SP and Company is perfect because of it's size and how quickly it can be colored or paper pieced. Creating your own background paper using text makes is so easy to add your sentiment. Using foam tape adds dimension and allows you to quickly adhere your finished panel to the card base. Hope you enjoyed this week's Tuesday Tips and Tricks! Thanks for stopping by! Hi,I love this card,the colours are very nice and the picture so sweet!!! !